In the civilized world, "pudding" only means one thing: pudding. In England, though, "pudding" is the generic term for any dessert. It's similar to the way idiots in the Southern US call all soda "Coke." So in Pink Floyd's "Another Brick in the Wall," when the teacher says "If you don't eat yer meat, you can't have any pudding! How can you have any pudding if you don't eat yer meat?!" it's not actual pudding he's talking about. The line, of course, refers to finishing the boring bits before getting to the good stuff - all of which is a roundabout way of saying "we're reviewing Superman." President Lex Luthor uses the impending threat of a giant Kryptonite asteroid hurtling toward Earth to frame Superman and declare a bounty on the heads of the Man of Steel and Batman. Heroes and villains alike launch a relentless pursuit to bring these Public Enemies to justice. Evading the onslaught, Superman and Batman must unite to stop the asteroid, save the world, and uncover Luthor's devious plot. The Target-exclusive "Public Enemies" series is, like most DC Universe series, a mix of characters we really want, and characters we really don't. Poe's already covered Batman, so the other unwanted figure falls to me. At least Bruce is a cool character; Clark can't even really claim that. To say nothing of the fact that Batman has had dozens of various costumes over the years, each with small cosmetic changes, so each toy at least has the potential to represent something new. Supes, on the other hand, is the iconic superhero design, and so every time he's more of the same. If nothing else, at least the Public Enemies figures don't re-use the same few bodies we've grown so sick of accustomed to. In fact, it's a lot closer to the old DCSH mold than DCU - the detail is a bit softer. The figure stands 6⅝" tall, which is quite a bit larger than the recent DCU figures, but since when has Mattel ever given a crap about making their toys the right size? They are in fact known for almost the exact opposite - this is the company that purposely downsized villains just so they wouldn't be taller than the hero. This particular figure, by way of comparison, almost fits in better with DC Direct than any Mattel product. Bury him in a display or rig a flying pose, though, and you'll never notice. 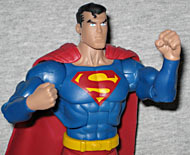 We've already seen a Superman headsculpt based directly on Ed McGuinness's art, and this isn't that (thank goodness). It's definitely based on the cartoon, though, which is somehow less stylized than E. McG's comic work. Honestly, compared to the emaciated cancer survivor face on the DCSH version and the... 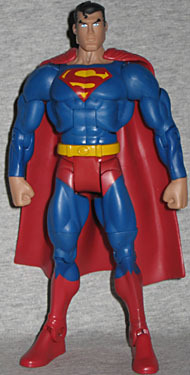 I don't know, eminently forgettable DCU version, this is my favorite Mattel Superman head. It's blocky yet soft, and easily unyielding, and that's perfect for both Superman and Clark Kent, something none of the others have been. The downside, though, is the paint. Not the too-small symbol on his chest, though that is annoying: no, the biggest problem is his skintone. Whoever color-designed this picked a shade a few pages too deep into their Pantone book, so Supes looks like he has a deep end-of-summer tan. Yes, that might make sense: since the guy is a living solar battery, he spends all his free time in the sun, but it's darker than the cartoon art; if I had to guess, I'd wager whoever picked his color took a screenshot of the cartoon, used the eyedropper tool on his skin, and just went with the resulting tone, not considering the differences between RGB (light-based color, such as a monitor would have) and CMYK (pigment-based color, like paint or plastic dye). Remember, everyone: it's sometimes more important that things look right than that they actually are right. 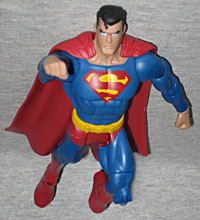 Superman is articulated like any other DCU figure: almost good enough, but not quite. No surprise, there are no double knees and no double elbows. On the plus side, his neck balljoint has enough range of motion to allow him to look up and down - that's more than we've been able to say for several series, now. His torso hinge wants to lean back permanently back, partially because of the weight of his cape, partially because it can't move forward far enough to "catch" at the forward position and stay. He's not terrible, though. The figure has no accessories, but he does come with a translucent oval base, which is handy, since he wants so badly to lean back. He also comes with a BAF piece, the right arm of volcanic villain Brimstone. 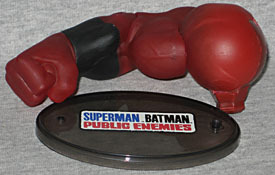 It's 4¾" tall, moves at the shoulder, bicep, elbow and wrist, and is cast from a dark red translucent plastic with a dark grey wristband painted on. The fully assembled guy? He's gonna look really cool! 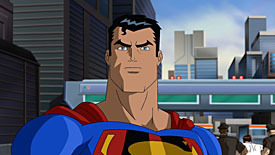 Superman is, no question, the lamest figure in this series. 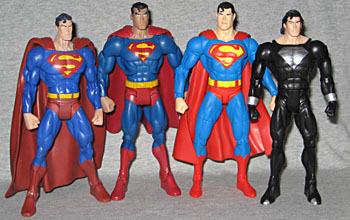 He's superfluous, and he's unpopular - go to Target and you'll see a dozen unsold Supermen and Batmen, and no one else. A situation not aided at all by the fact that this Public Enemies series was divided into two incomplete waves, and that Superman was heavy-packed in both of them! If the normal version didn't sell, why would the sparkly metallic suit do any better? Brimstone and some of the others in this series are the pudding - Superman's the meat.